8 Broadcaster Press January 1, 2019 www.broadcasteronline.com Save $30 on a Summer AC Tune-Up! New Ways to Help Protect Your Home and Family Just give us a call and we’ll comes to your (StatePoint) When it “Beyond investing in an insurance home, there is unfortunately no shortage policy, integrated smart home technolsend out a qualified of things that can go wrong and no short- ogy can go a long way toward helping Serviceage of culprits, from wicked weather to Technician like you protect your home,” says Pat Gee, electrical fires. senior vice president of Personal InsurTyler, to make sure your High winds, plumbing and appliance ance Claim at Travelers. “Some of the AC unitissues, hail, leaky roofs, frozen pipes and most common situations we see might be is ready for those break-ins -- these are some of the most prevented or mitigated with the use of hot summer South Dakota frequent causes of property damage, smart home technology.” Tyler Reiser according to Travelers, which analyzed Gee points out that with a smart water days and save $30! * Service Technician eight years of its homeowners insurance sensor, for example, you could be alerted 13 years experienceat the first sign of excess water where it claims. But experts say that there are steps doesn’t belong and take care of it before you can take to help protect your home it’s too late, or, with a smart motion senand family from situations beyond your sor, you’ll know about unusual activity control, particularly when it comes to on your property in real time. some of the most common issues. Travelers thinks that smart home technology is a game changer when it comes to protecting homes and property, so it has teamed up with Amazon to offer integrated smart home solutions at a discount to the insurer’s eligible customers. Customers can choose between a Smart Kit, Smart Kit Plus and Smart Kit Premier, which include an Amazon Echo Dot, security cameras, water sensors, motion detectors and a smart home hub to centrally control these devices from one app. Travelers is also offering discounted kit installation, providing free Amazon Echo Dot devices to eligible customers, and has introduced new Alexa skills to help answer billing questions and provide property maintenance and home safety advice to all consumers, with more skills planned for the future. To learn more, visit the insurance industry’s first digital storefront at Amazon.com/Travelers. “Traditional smoke alarms and home security systems are helpful, but there are new, proactive ways to monitor your home, including devices that are easier to use and more affordable than ever,” says Gee. “There has never been a better time to explore smart home solutions that can enhance your home’s security and help provide peace of mind.” When You Want Comfort...You Want Kalins When You Want Comfort… You Want Kalins! 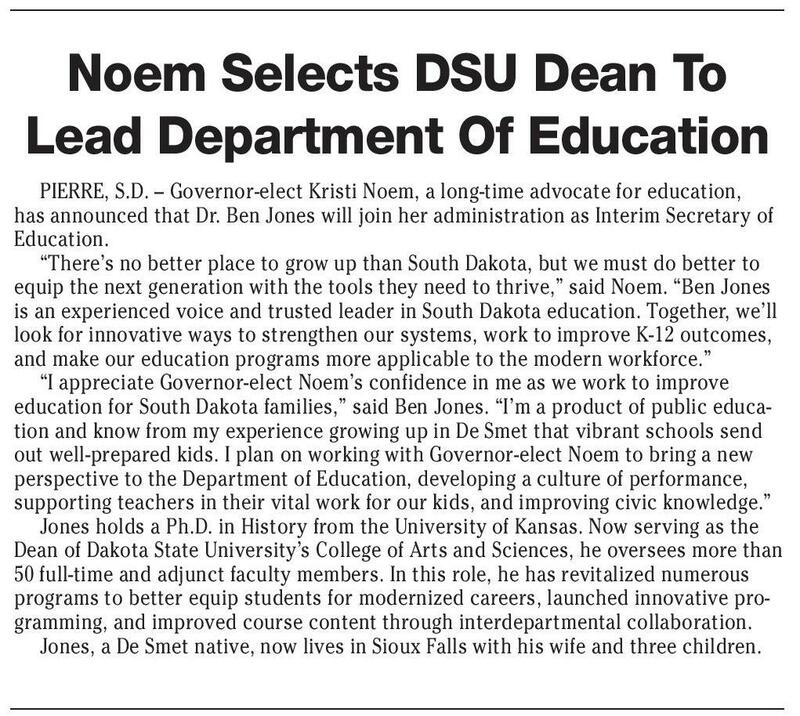 Noem Selects DSU Dean To Lead Department Of Education Vermillion: 605-624-5618 *Rebate offer only available to Vermillion Light & Power customers. Call for full details. 69 years as a Premier Lennox® Dealer 97 years in the Business 400 years of Heating and Cooling Experience = Your #1 Choice in Vermillion! Yankton Vermillion Sioux City 605.665.4348 605.624.5618 712.252.2000 kalinsindoor.com PRIME HUNTING GROUND SALE Marindahl Township, Yankton County, SD - Martin Madsen Estate REQUEST FOR SEALED BIDS Sealed bids will be accepted at Legacy Law Firm, 7404 Bitterroot Pl, Sioux Falls, SD 57108, for the sale of the following real property located in Marindahl Township, Yankton County, SD. PARCEL 1 26/95/54 SE1/4 of the SE1/4 of Section 26, and Township 95N, Range 54, west of the 5th P .M., Yankton County, South Dakota. Containing 40 acres. PARCEL 2 35/95/54 NE1/4 of the SE1/4 in Section 35, Township 95N, Range 54, west of the 5th P .M., Yankton County, South Dakota, containing 39 acres. PARCEL 3 35/95/54 NE1/4 of the NE1/4 of Section 35, Township 95N, Range 54, west of the 5th P .M., Yankton County, South Dakota, containing 40 acres. SE4 SE4 NE4 SE4 NE1/4 NE1/4 This property is located 3 miles west of Wakonda, SD, 1/2 miles south on 452nd Avenue, and 1/2 mile west on 303rd Street. Sealed bids must be delivered to Legacy Law Firm by 5 PM January 14, 2019. Cashiers check payable to Martin Madsen Estate in an amount equal to 10% of the bid must be included with the sealed bid. Bidders should include name, address, and telephone number as well as the total amount of bid and the number of parcel bidding on. 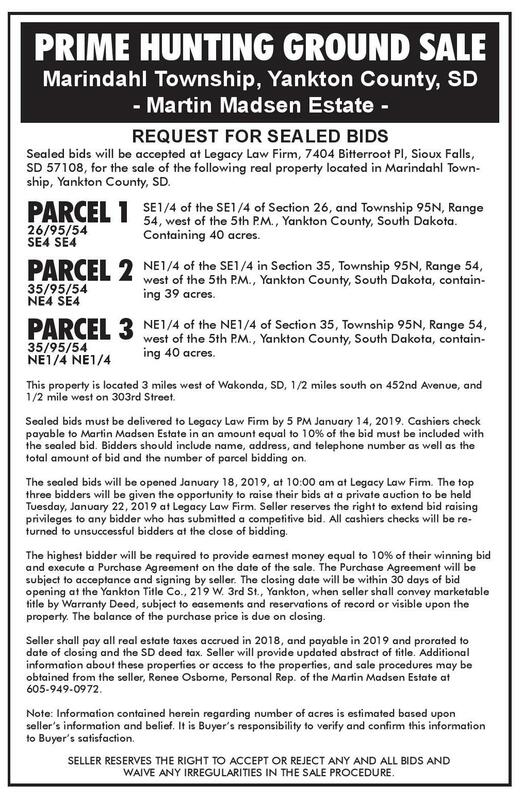 The sealed bids will be opened January 18, 2019, at 10:00 am at Legacy Law Firm. The top three bidders will be given the opportunity to raise their bids at a private auction to be held Tuesday, January 22, 2019 at Legacy Law Firm. Seller reserves the right to extend bid raising privileges to any bidder who has submitted a competitive bid. All cashiers checks will be returned to unsuccessful bidders at the close of bidding. The highest bidder will be required to provide earnest money equal to 10% of their winning bid and execute a Purchase Agreement on the date of the sale. The Purchase Agreement will be subject to acceptance and signing by seller. The closing date will be within 30 days of bid opening at the Yankton Title Co., 219 W. 3rd St., Yankton, when seller shall convey marketable title by Warranty Deed, subject to easements and reservations of record or visible upon the property. The balance of the purchase price is due on closing. Seller shall pay all real estate taxes accrued in 2018, and payable in 2019 and prorated to date of closing and the SD deed tax. Seller will provide updated abstract of title. Additional information about these properties or access to the properties, and sale procedures may be obtained from the seller, Renee Osborne, Personal Rep. of the Martin Madsen Estate at 605-949-0972. Note: Information contained herein regarding number of acres is estimated based upon seller’s information and belief. It is Buyer’s responsibility to verify and confirm this information to Buyer’s satisfaction. SELLER RESERVES THE RIGHT TO ACCEPT OR REJECT ANY AND ALL BIDS AND WAIVE ANY IRREGULARITIES IN THE SALE PROCEDURE. PIERRE, S.D. – Governor-elect Kristi Noem, a long-time advocate for education, has announced that Dr. Ben Jones will join her administration as Interim Secretary of Education. “There’s no better place to grow up than South Dakota, but we must do better to equip the next generation with the tools they need to thrive,” said Noem. “Ben Jones is an experienced voice and trusted leader in South Dakota education. Together, we’ll look for innovative ways to strengthen our systems, work to improve K-12 outcomes, and make our education programs more applicable to the modern workforce.” “I appreciate Governor-elect Noem’s confidence in me as we work to improve education for South Dakota families,” said Ben Jones. “I’m a product of public education and know from my experience growing up in De Smet that vibrant schools send out well-prepared kids. I plan on working with Governor-elect Noem to bring a new perspective to the Department of Education, developing a culture of performance, supporting teachers in their vital work for our kids, and improving civic knowledge.” Jones holds a Ph.D. in History from the University of Kansas. Now serving as the Dean of Dakota State University’s College of Arts and Sciences, he oversees more than 50 full-time and adjunct faculty members. In this role, he has revitalized numerous programs to better equip students for modernized careers, launched innovative programming, and improved course content through interdepartmental collaboration. Jones, a De Smet native, now lives in Sioux Falls with his wife and three children. 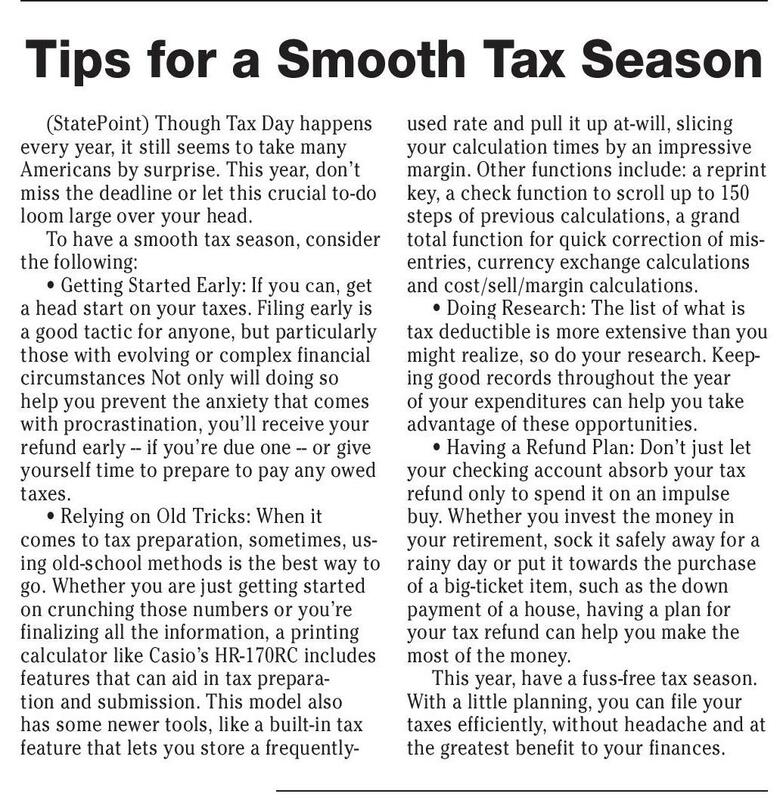 Tips for a Smooth Tax Season (StatePoint) Though Tax Day happens every year, it still seems to take many Americans by surprise. This year, don’t miss the deadline or let this crucial to-do loom large over your head. To have a smooth tax season, consider the following: • Getting Started Early: If you can, get a head start on your taxes. Filing early is a good tactic for anyone, but particularly those with evolving or complex financial circumstances Not only will doing so help you prevent the anxiety that comes with procrastination, you’ll receive your refund early -- if you’re due one -- or give yourself time to prepare to pay any owed taxes. • Relying on Old Tricks: When it comes to tax preparation, sometimes, using old-school methods is the best way to go. Whether you are just getting started on crunching those numbers or you’re finalizing all the information, a printing calculator like Casio’s HR-170RC includes features that can aid in tax preparation and submission. This model also has some newer tools, like a built-in tax feature that lets you store a frequently- used rate and pull it up at-will, slicing your calculation times by an impressive margin. Other functions include: a reprint key, a check function to scroll up to 150 steps of previous calculations, a grand total function for quick correction of misentries, currency exchange calculations and cost/sell/margin calculations. • Doing Research: The list of what is tax deductible is more extensive than you might realize, so do your research. Keeping good records throughout the year of your expenditures can help you take advantage of these opportunities. • Having a Refund Plan: Don’t just let your checking account absorb your tax refund only to spend it on an impulse buy. Whether you invest the money in your retirement, sock it safely away for a rainy day or put it towards the purchase of a big-ticket item, such as the down payment of a house, having a plan for your tax refund can help you make the most of the money. This year, have a fuss-free tax season. With a little planning, you can file your taxes efficiently, without headache and at the greatest benefit to your finances. Is Your Family What everyone is reading. Prepared for an Emergency? www.broadcasteronline.com www.plaintalk.net (StatePoint) With wildfires, floods, earthquakes, tornadoes and hurricanes occurring around the world, having access to safe drinking water in the event of an emergency should be top of mind no matter where you live. Natural disasters can contaminate and disrupt water supplies, making it difficult to access safe drinking water at home. Emergencies also force families out of their homes, making it necessary to hydrate from natural water resources where harmful contaminants like bacteria, chemicals, microplastics and heavy metals may be present. “The everyday public health concern of water contamination is elevated during emergencies, when water can be unreliable for drinking,” says Alison Hill, managing director of LifeStraw, a manufacturer of water filtration systems that is often involved in disaster relief both in the U.S, and around the globe. “If an emergency has your family on the move, being able to hydrate safely from any fresh water source -fountains, streams, rivers and ponds is key,” points out Hill. When building your emergency supply kit, be sure to include a portable filter to help eliminate harmful contaminants from your drinking source. LifeStraw makes it easy to hydrate safely at home and outdoors. LifeStraw Go is a refillable bottle that incorporates a two-stage filter removing bacteria, chemicals, microplastics and bad taste from drinking water. Another good option for personal use is LifeStraw Flex, a multi-use filter that removes heavy metals including lead as well as bacteria and parasites. Finally, those traveling in groups may find it more efficient to use a filter specifically designed for a crowd, such as the brand’s Mission model, a high-volume gravity-powered purifier that also filters viruses, available in a 12-liter compact roll bag. Being prepared for any situation will help keep your family safe and healthy, for whatever comes your way. Gain the confidence of knowing that you will have access to safe water for days, weeks and even months should your water supply be compromised by a natural disaster or other emergency.